You already know that I don't care much for coffee. 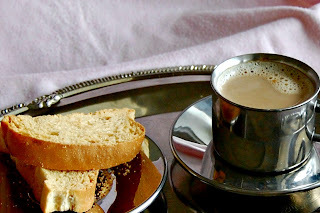 But since my husband likes instant coffee, I wanted to slowly introduce filter coffee to him. 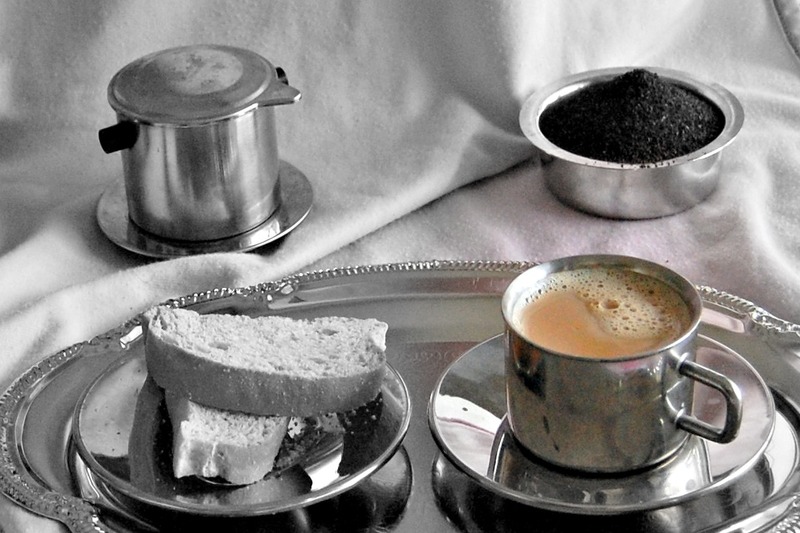 After all, South Indian Filter Coffee is the real deal, right? But, we don't have ready access to traditional filter coffee powders like narasus or even coffee day. And, I do not own one of those stainless steel 2-tiered coffee filters. Thus, majorly lacking the key ingredients, my quest for the perfect filter coffee began. This is my coffee making arsenal now. Coffee Powder: Living in the Southern US means that we have easy access to Louisiana's Community coffee. I look for their New Orleans Blend and only if it is not available, I settle for this. Not sure what the difference is, but I get complements on my coffee when I use the former. 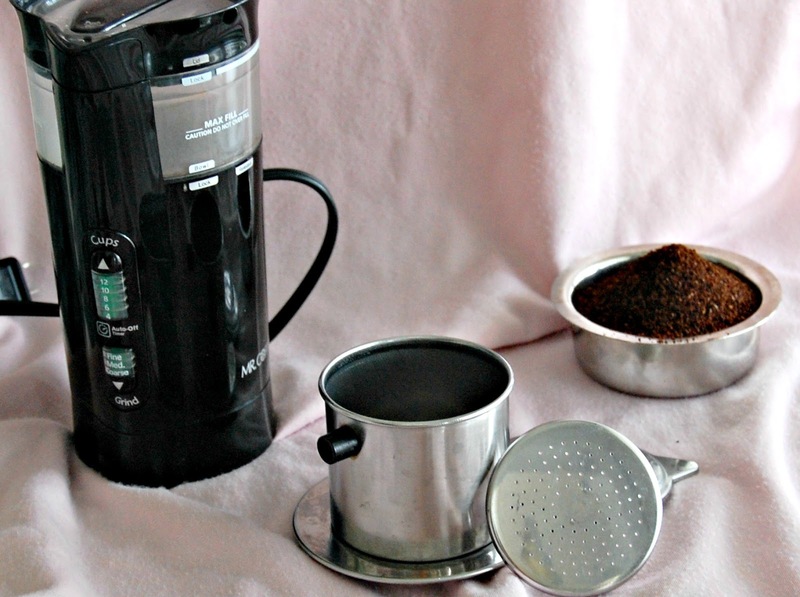 Coffee Filter: The Vietnamese coffee filter which is pretty close to the one that my mom uses. The South Indian one has two parts - a reservoir and a receptor while the Vietnamese one has only a reservoir. Coffee Grinder: Though New Orleans Blend tastes very similar to South Indian Filter Coffee Powder, it is a little coarser. To help it drip well in the Vietnamese Filter, I grind the powder on Fine setting before brewing the decoction. 3 tablespoons of New Orleans Blends ground on "Fine" setting. You will also need a coffee filter. On medium flame, bring 1 cup of fresh water to a rolling boil. Meanwhile, grind 3 tbsp of New Orleans Blend. Pack the ground powder tightly in the reservoir. Place the Perforated Lid on top and press down tight. This helps in getting maximum strength decoction, as the water takes more time passing through the tightly packed coffee grounds. When the water is ready, place the filter on top of its own receptor or an appropriately sized glass/cup/bowl. Carefully pour the boiling water slowly on top of the perforated lid, taking care to not disturb the coffee grounds. Close the reservoir with a tight fitting lid. Remember, the walls of the reservoir will be very hot. Walk away. Do not disturb the filter for the next 1 to 4 hours. This decoction is adequate for 4 servings. Scald a scant cup of milk. Add 1.5 tbsp of the decoction prepared as above. Use a frother/foamer or mix vigorously to create foam. This preparation yields a medium-strong cup of coffee. I miss filter coffee, you made it very well. Thank you for the compliment, Swathi. I hope you try this and like it, too! The word decoction is a noun. The word is used to refer concentrated liquor resulting from heating or boiling a substance, especially a medicinal preparation made from a plant. 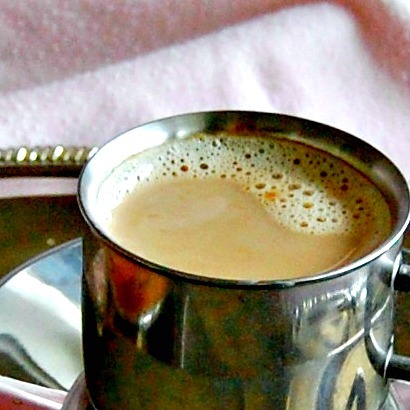 The liquid that you get from the coffee brewing process is called brew and not decoction.